The next generation of laser alignment systems has been released from the pioneers of such products - Sniper Alignment Systems. With new manufacturing processes Sniper have been able to create the most accurate, versatile and cost effective way to own any laser alignment system. The New system is known as the V2, the V standing for variable spindle sizes and the 2 refers to 2 lasers. It is made from a pair of high pressure die cast units chrome plated for superior durability. The units locate onto any spindle size between 16mm & 32mm via a magnetized Vee Block. 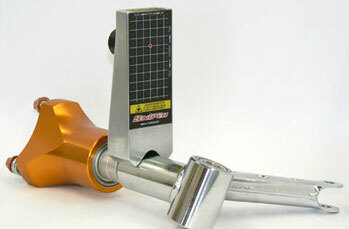 The Vee block base is considerably wider than many other clamping systems on other units, to provide superior accuracy. With this system you may even be able to fit and remove the units without having to remove your front wheels (see above), making it by far the quickest and easiest unit on the market to fit and remove.